We almost had a tragic Knitting Olympics equipment failure. The other night, a peaceful, quiet evening at home with me on the phone, Elly Cairn resting on the couch, and Parker Cairn ripping pieces from his favorite stuffed animal. Only when I turned around, it wasn't his favorite stuffie. Parker had a ball of expensive GGH Soft Kid, trying to rip the ball band out, all in his way be damned even if it was fluffy soft pricy yarn. The boy loves him some paper products, and ball bands are high on his list of fine dining. I grabbed the yarn, expecting to see scores of 5 inch pieces but amazingly, all that was ripped from the skein was a couple of yards. For the life of me, I can't get a great shot of the color of this yarn, no matter what light I take it in. Look at that cool ruffle at the bottom! This ruffle wasn't bad to knit but I only bound off about 300 stitches with it. I imagine the final ruffle isn't going to go by nearly so quickly. 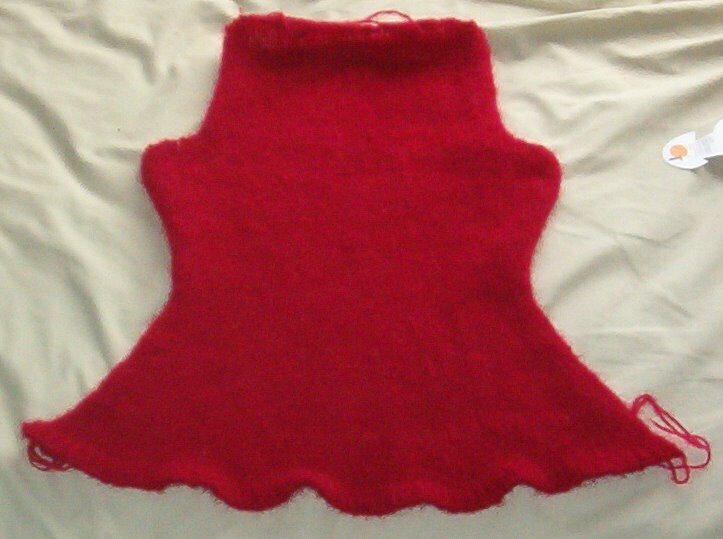 This is really going quickly compared to Salina which is knit at the exact same gauge and has similar measurements. Maybe it's just my imagination. Or maybe I've flying because I love this yarn so much. On another note, it got up to 70 degrees today. It's February in Kentucky, that just doesn't happen! But as they say, if you don't like the weather here, stick around. It will change tomorrow. It will be in the 30's tomorrow. Nice. But on a really comfortable day out, I actually broke out Lucky! Wow, the yarn color looks stunning! I bet it's just gorgeous in person, especially with that plush texture from the mohair. Buddy has avoided the yarn so far...unless it falls on the floor--then it's fair game!!! you are so speedy!! I love the bright red! Keep on knitting kiddo! I am a total knitting olympics loser, my project has about five rows done. We had to take a quick trip to avoid deportation. Since I was at the beach I didn't knit a stitch in 5 days. Can I claim a grion injury like Michelle Kwan? It looks like a sweater!